Blockchain is now losing synonymity with bitcoin and is being acknowledged as an enterprise technology. At the same time, the stakeholders in the private equity trading and startup fundraising ecosystem are now looking beyond the hype of the ICOs to explore how this technology can work for them. Using blockchain based platforms for private shares trading and SME fundraising can benefit several stakeholders involved in the private and SME fundraising ecosystem – startups and SMEs, angel investors, venture capitalists, private equity firms, crowdfunding platforms, and financial regulators, among others. 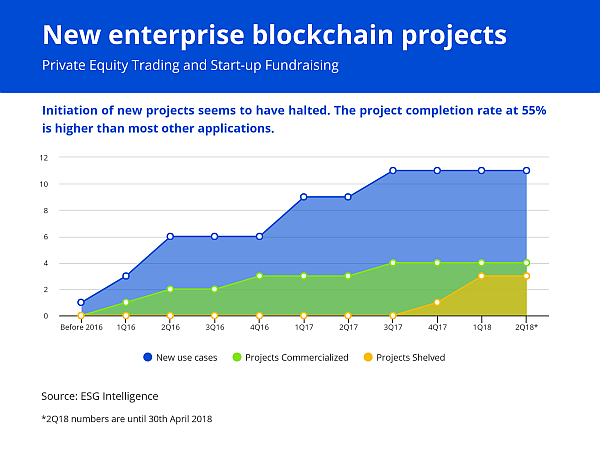 There are several enterprise blockchain projects that have been initiated by different stakeholders, as they are keen to unearth the benefits that such platforms can bring to the table. While pilot tests in some of these projects have yielded positive results, there are several challenges that need to be overcome, before such platforms see commercialization. We also note that 36% of the projects have been successfully commercialized, 27% of projects have been shelved for various reasons.